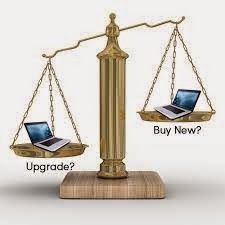 Houses & Homes VA: How do we know if it’s time to upgrade or to buy a new computer? How do we know if it’s time to upgrade or to buy a new computer? As you already know, technology is constantly changing and deciding whether to “improve” your existing computer or to buy a brand new one can be a difficult decision to make. Many people think that just adding more RAM and maybe a bigger (or separate) hard drive for more storage is all they need, but this is not always the case. The first sign of an aging computer is its speed, or lack thereof. Remember when you first bought your computer how quick it was? If you’ve had it a while you have noticed that it’s much slower than it was before. This is normal for computers. Over time a lot of “junk” and unnecessary files accumulate on the hard drive and eventually slow everything down. I have seen (and tried) a lot of programs designed to speed up an aging computer but none of them seem capable of returning a computer to the state that it was in first out of the box. A very tech savvy friend of mine explained to me that the only way to return an older computer to like new working condition is to “reformat” the hard drive. That simply means reinstalling the operating system (Windows 7, XP, etc.) all over again. In other words, starting over. That’s not a bad idea but it does mean losing ALL of the information that you have accumulated over the years. To do this you must save all of the information in your computer that you don’t want to lose. You must also reinstall all of the programs that you need that did not come with the computer when you bought it. As you can imagine, that’s a lot of work and I wonder who has the time for such an effort? There are some less dramatic things that you can do help improve the performance of your computer. Defragmenting your hard drive regularly will help to speed things up a bit. Using a registry cleaner can speed up how quickly your computer starts up and disabling unnecessary programs that start automatically can also help you with this goal. Assuring that your hard drive (usually Disk C in your computer) has at least 15% free space will also help to make things just a bit quicker. In my personal experience I have found that having adequate RAM (Random Access Memory) is probably one of the most effective ways to boost a computer’s performance. It’s important to note however that the amount of RAM is limited and you will need to know how much RAM you have AND how much your particular computer will allow you to add. As a general reference, if you have at least 4GB of RAM and your computer is still painfully slow, adding more may not be the answer. If everything is working well with your computer but you have problems playing video, it is possible that updating your graphics card could be all that you need to solve the problem. Again, you must be sure that the motherboard (the brain) of your computer can work with a newer and faster graphics card. If not, you will be wasting your money. Even if the only problem that you have with your older computer is as simple as not having the proper ports (ways to connect to other devices) such as having enough USB ports you can easily fix these problems with a few inexpensive add ons but again, does your older computer support these newer components? Finally, a new processor is always a good way to improve performance but the computer must be able to “keep up” with it. In other words, a new i7 chip in a 10 year old computer may not work or won’t improve the overall performance as much as you think it will. As you can see, deciding what to do is not as difficult as deciding how to do it! To be honest, in my experience it is almost always better to purchase a new computer than to try and upgrade an older model but sometimes upgrading is a viable solution. Considering the low cost of basic but new machines available on the market today, it is probably better to buy a new computer than to try and upgrade one that is 4 or 5 years old. For a very reasonable $400 or $500 you can buy a desktop that is sure to be reliable and much quicker than your older machine. A comparable laptop will probably be about $200 more but will have the same features and offers the portability that you might need. If you are not a computer “guru” (I am not!) than I suggest that talking to someone that is should be your first step before making a final decision. In the end you just might find that a new computer is the best choice for you.